Mon., March 19, 2012, 8:04 a.m. FLY FISHING – Registration is underway for the following fly fishing clinics being offered at Silver Bow Fly Shop, 13210 E Indiana Ave., telephone 924-9998. Winter Steelhead Clinic: Learn winter Spey rod tactics from master guide and spey line designer Tom Larimer, April 6, 6 p.m.-8 p.m. Free. Beginner Spey Class with Tom Larimer, April 7, 8 a.m.-noon. Cost: $150. Rods/reels provided. 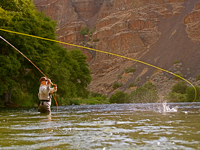 Advanced Spey Class with Tom Larimer, April 7, 1:30 p.m.-5:30 p.m. Cost: $150. Rods/reels provided.